Puerto Rico has no voting representation in Congress. That has invariably hobbled its ability to obtain necessary relief after Hurricanes Maria and Irma. But some in Washington are paying attention and using the island’s mainland advocates to press the issue. On Friday US Senator Elizabeth Warren’s campaign released a video featuring Holyoke Ward 4 Councilor Jossie Valentin and her work on behalf of her ancestral homeland. Since the twin hurricanes battered the island last year, Valentin has undertaken three relief missions to the island. In doing so, she has become one of the 413’s most visible advocates for Puerto Rico both on a humanitarian level but also in terms of debt relief for the American possession. “I’m in this because this fight is personal,” she told WMassP&I, echoing Warren’s oft-repeated phrase. In the video, Valentin praised the attention Warren had given the disaster on Puerto Rico. Filmed earlier this summer in Holyoke, she explains how Warren has called out the unacceptable response to the disaster. Valentin also observes Warren, whose pre-political work was in bankruptcy and consumer financial protection, had been in the island’s corner ever since its debt crisis crested in 2016. Though clearly part of the senator’s reelection effort, the video also spotlights Valentin’s work. In a phone interview with WMassP&I on Saturday, she said she had visited the island three time since the storms and organized countless care package drives. During her first trip last November, Valentin said she and her wife deliver 185 packages to 15 different cities across Puerto Rico. “It was the [trip] where we impacted the most number of cities and towns,” she said. In succeeding trips, Valentin brought other essentials like gift cards to CVS and Walgreens to the island. “Jossie is a champion for Puerto Rico and families across Massachusetts. I’m honored to fight alongside her,” Warren said in a statement. During her travels, Valentin also got to know Carmen Yulín Cruz, the mayor of San Juan, who has come to Western Massachusetts to speak about the crisis. The mayor famously declared, “We are dying!” in response to federal officials’ now laughable assurance that relief efforts were just swell. The storms also ripped off any pretext that Puerto Rico’s situation had stabilized after Congress imposed a control board to tackle the fiscal crisis. A wholly inadequate response from the federal government from Donald Trump—especially Trump—on down exacerbated Mother Nature’s blow. The real estate tycoon and provocateur’s paper towel tossing was an allegory for the feds’ relief efforts: distant, ineffectual, incompetent and pathetic. Although Puerto Rico is not a state, its residents have been US citizens for 101 years. Consequently, they qualify for many federal programs like disaster relief. However, the response paled comparison to those undertaken for Texas and Florida earlier in 2017. Valentin acknowledged improvements since, but electricity is still out in many places. The largely rural interior remains in the worst shape, but poorer areas of cities often fare no better. 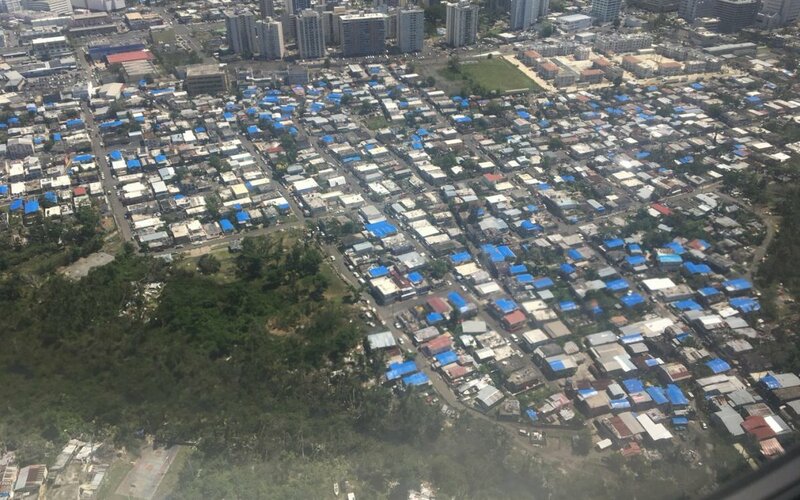 One persistent problem is the abundance of blue tarped roofs. Made famous by Hurricane Katrina struck New Orleans, the tarps are supposedly temporary pending Federal Emergency Management Agency approval of funds for repairs. Unfortunately, a high rejection rate has made them ubiquitous in Puerto Rico. Formal relief may be inadequate anyway. FEMA usually only pays to restore home back to their prior state, a questionable endeavor as many were in substandard condition before. “There are some cities and towns that have over a 1000 blue roofs,” Valentin lamented. Warren’s video was timed to coincide with her bill that would cancel Puerto Rico’s debt. It would also relieve the US Virgin Islands, which also suffered incredibly devastation. Warren’s legislation was cosponsored by her Massachusetts colleague Ed Markey, Vermont Senator Bernie Sanders and others. On Saturday, Warren held her 31st town hall and again raised the issue of Puerto Rico. She pushed both a Marshall Plan of sorts to upgrade infrastructure debt relief like the kind in her bill. Valentin has been an occasional lightning rod in Holyoke politics. This is mostly because of forceful positions she has taken, particularly on social justice issues. Yet, much of the condemnation comes from the Paper City’s political grumps. There is little to criticize about her relief efforts, however. “Except for the people I’m never going to make happy, the response has been very, very positive,” she said. Not the least of which has been Warren herself. She “took the time to spend time with me back stage to thank me for the video and the work on the island,” Valentin said, practically beaming through the phone. “I know that she is saying these things because she truly is the champion that we need,” she continued. First elected to the Council in 2013, Valentin’s profile beyond Holyoke began to rise after endorsing Senator Sanders in 2016. She introduced him at a rally in Amherst and became a delegate for Sanders. At the national convention in Philadelphia, she made additional connections from across the country. Though she is loath to leave Holyoke Community College where she is an academic counselor, Valentin doesn’t deny future ambitions. But her focus is on the impact she can have now. Her turn in Warren’s spotlight is a way to help a place and people there she cares about deeply. “I’m just trying to use the platforms that I have and that I’ve been a part of to continue my narrative to continue to push what I believe the people of Puerto Rico need,” she said.